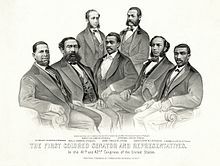 The first African Americans to serve in the United States Congress were Republicans elected during the Reconstruction Era. After slaves were emancipated and granted citizenship rights, freedmen gained political representation in the Southern United States for the first time. White Democrats regained political power in state legislatures across the South and worked to restore white supremacy. By the presidential election of 1876, only three state legislatures were not controlled by white Democrats. The Compromise of 1877 completed the period of Redemption by white Democratic Southerners, with the withdrawal of federal troops from the South. State legislatures began to pass Jim Crow laws to establish racial segregation and restrict labor rights, movement and organizing by blacks. They passed some laws to restrict voter registration, aimed at suppressing the black vote. From 1890-1908, Democratic state legislatures in the South essentially disfranchised most blacks and many poor whites from voting by passing new constitutions or amendments, or other laws related to more restrictive electoral and voter registration and electoral rules. The Democratic Party essentially dominated the "Solid South" until the 1990s. As a result of the Civil Rights Movement, the U.S. Congress passed laws in the mid-1960s to end segregation and enforce constitutional civil rights and voting rights. During two waves of massive migration within the United States in the first half of the 20th century, more than 6 million African Americans moved from the South to Northeastern, Midwestern and Western industrial cities, with 5 million migrating from 1940 to 1970. Some were elected to national political office from their new locations. During the Great Depression, many black voters switched allegiances from the Republican Party to the Democratic Party, in support of the New Deal economic, social network, and work policies of Franklin D. Roosevelt's administration. This trend continued in the 1960s when the national Democratic Party supported the civil rights legislation to enforce constitutional rights. At the same time, there was a different movement among whites in the South, who began to vote for Republican candidates for national and then state offices. A total of 153 African Americans have served in the United States Congress, mostly in the United States House of Representatives. This includes six non-voting members of the House of Representatives who have represented the District of Columbia and the U.S. Virgin Islands. In addition, John Willis Menard was elected to the House of Representatives in 1868, and P. B. S. Pinchback was elected both to the House of Representatives and the Senate in 1872, but neither was seated due to election disputes. January 25, 1870, letter from the Governor and Secretary of State of Mississippi that certified the election of Hiram Rhodes Revels to the Senate. The right of blacks to vote and to serve in the United States Congress was established after the Civil War by amendments to the Constitution. The Thirteenth Amendment (ratified December 6, 1865), abolished slavery. The Fourteenth Amendment (ratified July 9, 1868) made all people born or naturalized in the United States citizens. The Fifteenth Amendment (ratified February 3, 1870) forbade the denial or abridgment of the right to vote on account of race, color, or previous condition of servitude, and gave Congress the power to enforce the law by appropriate legislation. In 1866, Congress passed the Civil Rights Act and the four Reconstruction Acts, which dissolved all governments in the former Confederate states with the exception of Tennessee. It divided the South into five military districts, where the military through the Freedmen's Bureau helped protect the rights and safety of newly freed blacks. The act required that the former Confederate states ratify their constitutions conferring citizenship rights on blacks or forfeit their representation in Congress. As a result of these measures, blacks acquired the right to vote across the Southern states. In several states (notably Mississippi and South Carolina), blacks were the majority of the population. By forming coalitions with pro-Union whites, Republicans took control of the state legislatures. At the time, state legislatures elected the members of the US Senate. During Reconstruction, only the state legislature of Mississippi elected any black senators. On February 25, 1870, Hiram Rhodes Revels was seated as the first black member of the Senate, while Blanche Bruce, also of Mississippi, seated in 1875, was the second. Revels was the first black member of the Congress overall. Blacks were a majority of the population in many congressional districts across the South. In 1870, Joseph Rainey of South Carolina was elected to the U.S. House of Representatives, becoming the first directly elected black member of Congress to be seated. Blacks were elected to national office also from Alabama, Florida, Georgia, Louisiana, Mississippi, North Carolina and Virginia. All of these Reconstruction era black senators and representatives were members of the Republican Party. The Republicans represented the party of Abraham Lincoln and of emancipation. The Democrats represented the party of planters, slavery and secession. From 1868, southern elections were accompanied by increasing violence, especially in Louisiana, Mississippi and the Carolinas, in an effort by Democrats to suppress black voting and regain power. In the mid-1870s, paramilitary groups such as the White League and Red Shirts worked openly to turn Republicans out of office and intimidate blacks from voting. This followed the earlier years of secret vigilante action by the Ku Klux Klan against freedmen and allied whites. After the disputed Presidential election of 1876 between Democratic Samuel J. Tilden, governor of New York, and Republican Rutherford B. Hayes, governor of Ohio, a national agreement between Democratic and Republican factions was negotiated, resulting in the Compromise of 1877. Under the compromise, Democrats conceded the election to Hayes and promised to acknowledge the political rights of blacks; Republicans agreed to withdraw federal troops from the South and promised to appropriate a portion of federal monies toward Southern projects. With the Southern states "redeemed", Democrats gradually regained control of Southern legislatures. They proceeded to restrict the rights of the majority of blacks and many poor whites to vote by imposing new requirements for poll taxes, subjective literacy tests, more strict residency requirements and other elements difficult for laborers to satisfy. Starting with the Florida Constitution of 1885, white Democrats passed new constitutions in ten Southern states with provisions that restricted voter registration and forced hundreds of thousands of people from registration rolls. These changes effectively prevented most blacks and many poor whites from voting. Many whites who were also illiterate were exempted from such requirements as literacy tests by such strategies as the grandfather clause, basing eligibility on an ancestor's voting status as of 1866, for instance. Southern state and local legislatures also passed Jim Crow laws that segregated transportation, public facilities and daily life. Finally, racial violence in the form of lynchings and race riots increased in frequency, reaching a peak in the last decade of the 19th century. The last black congressman elected from the South in the 19th century was George Henry White of North Carolina, elected in 1896 and re-elected in 1898. His term expired in 1901, the same year that William McKinley, who was the last president to have fought in the Civil War, died. No blacks served in Congress for the next 28 years, and none represented any Southern state for the next 72 years. Map of congressional districts currently represented by African-Americans. From 1910 to 1940, the Great Migration of blacks from the rural south to northern cities such as New York, Philadelphia, Chicago, Detroit, and Cleveland began to produce black-majority Congressional districts in the North. Blacks could exercise their right to vote. In the two waves of the Great Migration through 1970, more than six and a half million blacks moved north and west and became highly urbanized. In 1928, Oscar De Priest won the 1st Congressional District of Illinois (the South Side of Chicago) as a Republican, becoming the first black Congressman of the modern era. DePriest was also the last black Republican elected to the House for 56 years. The election of President Franklin D. Roosevelt in 1932 led to a shift of black voting loyalties from Republican to Democrat, as Roosevelt's New Deal programs offered economic relief to people suffering from the Great Depression. From 1940 to 1970, nearly five million blacks moved north and also west, especially to California, in the second wave of the Great Migration. By the 1960s, virtually all black voters were Democrats, and most were voting in states outside the former Confederacy. It was not until after passage by Congress of the Voting Rights Act of 1965, the result of years of effort on the part of African Americans and allies in the Civil Rights Movement, that blacks within the Southern states recovered their ability to exercise their rights to vote and to live with full civil rights. Legal segregation ended. Accomplishing voter registration and redistricting to implement the sense of the law took more time. The only Southern cities to have black majority districts were Atlanta, Houston, Memphis and New Orleans. By that time, the only Southern rural area to have a black majority district was the Mississippi Delta area in Mississippi. Until 1992, most black House members were elected from inner-city districts in the North and West: New York City, Newark, New Jersey, Philadelphia, Baltimore, Chicago, Cleveland, Detroit, St. Louis and Los Angeles all elected at least one black member. Following the 1990 census, Congressional districts needed to be redrawn due to the population shifts of the country. Various federal court decisions resulted in states' creating districts to provide for some where the majority of the population were African Americans, rather than gerrymandering to exclude black majorities. Historically, both parties have used gerrymandering to gain political advantage, by drawing districts to favor their own party. In this case, some districts were created to link widely separated black communities. As a result, several black Democratic members of the House were elected from new districts in Alabama, Florida, rural Georgia, rural Louisiana, North Carolina, South Carolina and Virginia for the first time since Reconstruction. Additional black-majority districts were also created in this way in California, Maryland and Texas, thus increasing the number of black-majority districts. The creation of black-majority districts was a process supported by both parties. The Democrats saw it as a means of providing social justice, as well as connecting easily to black voters who had been voting Democratic for decades. The Republicans believed they gained by the change, as many of the Democratic voters were moved out of historically Republican-majority districts. By 2000, other demographic and cultural changes resulted in the Republicans' holding a majority of white-majority House districts. Since the 1940s, when decades of the Great Migration resulted in millions of African Americans having migrated from the South, no state has had a majority of African-American residents. Eight African Americans have served in the Senate since the 1940s: Edward W. Brooke, a Republican from Massachusetts; Carol Moseley Braun, Barack Obama, and Roland Burris (appointed to fill a vacancy), all Democrats from Illinois; Tim Scott (initially appointed to fill a vacancy, but later elected), a Republican from South Carolina; Mo Cowan (appointed to fill a vacancy), a Democrat from Massachusetts; Cory Booker, a Democrat from New Jersey, and Kamala Harris, a Democrat from California. 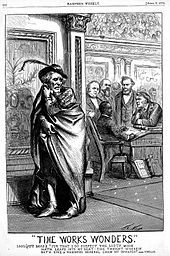 Political cartoon: Revels (seated) replaces Jefferson Davis (left; dressed as Iago from Shakespeare's Othello) in the Senate. Harper's Weekly Feb. 19, 1870. Davis had been a senator from Mississippi until 1861. ^ "First African American Senator". U.S. Senate. Retrieved July 25, 2012. ^ "Black Americans in Congress – John Mercer Langston". U.S. House of Representatives. Archived from the original on July 2, 2012. Retrieved July 27, 2012. Bailey, Richard. Black Officeholders During the Reconstruction of Alabama, 1867–1878. New South Books, 2006. ISBN 1-58838-189-7. Available from author. Foner, Eric. Freedom's Lawmakers: A Directory of Black Officeholders during Reconstruction. 1996. Revised. ISBN 0-8071-2082-0. Walton, Jr., Hanes; Puckett, Sherman C.; Deskins, Jr., Donald R. (2012). The African American Electorate: A Statistical History. Congressional Quarterly Press. ISBN 9780872895089. African American Members of the United States Congress: 1870-2012 A 66-page history produced by the Congressional Research Service. Black Americans in Congress, 1870-2007 C-SPAN video with Matt Wasniewski as the presenter. He discusses the history of African Americans in Congress since 1870 (164 minute in length).